The topic was “Steve Ray’s Six Rules for Dealing with Non-Catholics.” It is always a very popular topic because it’s where we all live. 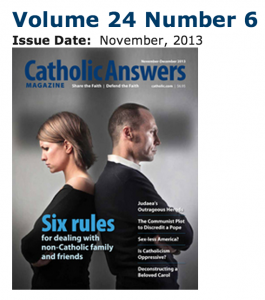 For a list of the Six Rules and to read the Catholic Answers Magazine article I wrote on the subject, see the blog post above or click here. 1) It was a very fun show; an hour flew by in minutes :-) You can listen on-line here and find other ways to listen here. 2) My friend is an atheist/agnostic; how do I reach her? 3) How do I get my wife to be understand the Catholic faith and join me in the Church? 4) My girlfriend has reservations about being baptized; what should I tell her? 5) My non-Catholic nephew is getting married in a non-Catholic ceremony; should our family go to the wedding? 6) How does 2 John 10 apply to evangelizing non-Catholics and Christians? Doesn’t it say we should not have them in our homes? 7) From Ireland: Many Catholics have turned away from the faith partly because of a hostile media. What can we do to counteract this trend?